Seven-time champion Roger Federer was stunned by 116th-ranked Sergiy Stakhovsky in the second round of Wimbledon on Wednesday, his earliest loss in a Grand Slam tournament in 10 years. It was already one of the most tumultuous days in Grand Slam tennis history, with seven players forced out by injuries, two of the top-3 seeded women eliminated and six former No. 1-ranked players leaving early. Here's what: the world's greatest grass-court player losing on his favourite Centre Court — the most famous stage in tennis — to a 116th-ranked opponent who had never beaten a top-10 player in his life. The result capped a chaotic day of injuries, walkovers, retirements and shock results. Third-seeded Maria Sharapova, the 2004 champion, fell to a 131st-ranked qualifier. No. 2 Victoria Azerenka was among the seven injury withdrawals — believed to be a Grand Slam single-day record in the Open era. Federer became the seventh former No. 1 player to exit the championships on this one day. After only three days of play, five of the top-10 seeded women and four of the top 10 men are already out of the draw. The owner of a record 17 major titles and the defending champion here, Federer hadn't been beaten in the second round or earlier at a Slam since a first-round defeat at the 2003 French Open. Federer said the end of his quarter-final run does not represent the end of an era. "I still have plans to play for many more years to come," he said. " It's normal that after all of a sudden losing early after being in the quarters 36 times, people feel it's different. " Federer's defeat was his earliest at the All England Club since a first-round loss in 2002 to No. 154-ranked Mario Ancic. 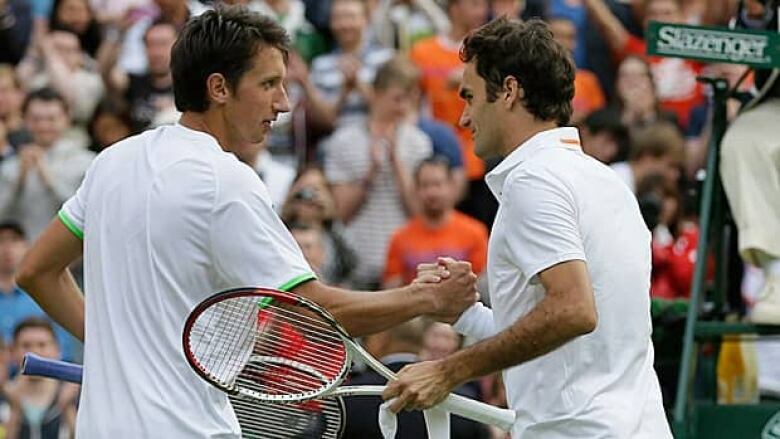 Stakhovsky is the lowest-ranked player to beat Federer at any event since then. In another women's match, Canadian teenager Eugenie Bouchard picked up the biggest victory of her career, beating 12th-seeded Ana Ivanovic, the 2008 French Open champion, 6-3, 6-3 to reach the third round. Among the casualties: Azarenka (walkover, right knee), men's No. 6 Jo-Wilfried Tsonga (retirement, left knee), John Isner (retirement, left knee) and Darcis (walkover, right shoulder). "Very black day," Cilic said of the spate of injury withdrawals. "The other days, other weeks, there were no pullouts. Everything just happened today." With Azarenka and Sharapova gone, the prospect of Serena Williams lifting the women's trophy for a sixth time look even stronger. Williams, who is riding a 32-match winning streak, had already been considered the overwhelming title favourite. Sharapova tumbled several times on the grass. Trailing 3-2 in the second set, her right leg gave way behind the baseline and she did the splits. The All England Club said it has "no reason to think" the court surface was to blame for the spate of injuries. "The court preparation has been to exactly the same meticulous standard as in previous years and it is well known that grass surfaces tend to be more lush at the start of an event," the club said in a statement. "The factual evidence, which is independently checked, is that the courts are almost identical to last year, as dry and firm as they should be, and we expect them to continue to play to their usual high quality." Murray's victory came not long after his potential quarter-final opponent, Tsonga, retired with a left knee injury while trailing Ernests Gulbis 3-6, 6-3, 6-3.